Customers loved the easy magnetic mount. Additionally, many commented on how easy it was to install. Finally, customers did not have too much difficulty removing the flow restrictors if they wished to do so, and, given the much higher price for the non eco-performance flow model, were happy to have the option to alter the flow settings. The most frequent complaint was that this particular model was made almost entirely of cheaper plastic materials and is only chrome plated. Additionally, this model did not last more than 6 months to a year for many customers. A few customers stated that the model did not arrive properly assembled or arrived missing some essential parts and had to adjust the installation in order to avoid leaks. As with the Magnetix 6 function handheld, purchasers loved the magnetic mount. Additionally, the customers loved the easy lever for changing the settings on the head. Finally, many customers liked that they could remove the restrictors for higher water pressure. Customers were most dissatisfied with the low water pressure overall, even after removing the restrictors. Additionally, some complained that it was hard to tell the difference between the different flow settings. Some customers had leaking problems when installing. While the showerhead and hose are brushed nickel, other parts of the product are made of plastic which frustrated some buyers who felt they paid too much. Customers gushed about the wide coverage and good pressure, even with the water restrictor installed (although some removed it). Additionally, the spot resistant brushed nickel also received praise as it definitely left a strong visual impression of a cleaner, newer shower head. Some customers recommended that the exceptionally wide showerhead was not ideal for a small walk-in shower. A very small minority complained that upon install it was not enough water pressure. Some customers preferred a more concentrated, narrow spray-down. 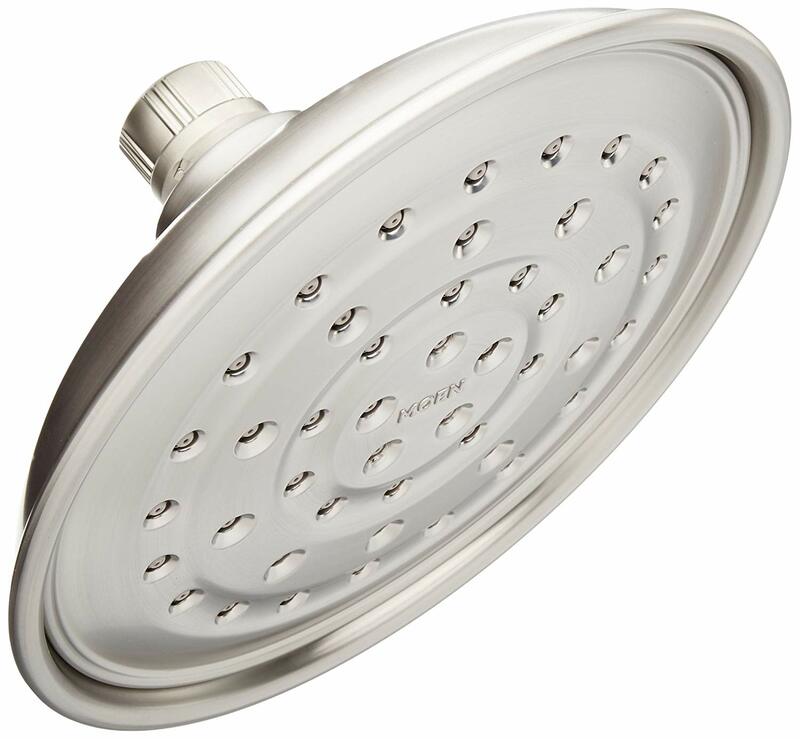 Large 9-inch diameter chrome plated rain showerhead with an aesthetically pleasing design. Customers with larger walk-in showers and baths loved the large diameter and soothing spread of water during the shower. They praise the aesthetic design and look of the shower head and the water pressure. Some purchasers felt that this showerhead had some design flaws. They did not like that the middle and inner rings of the shower head were not adjustable and could not be turned off. Additionally, the adjuster for flow is on the inside. Customers with hard water or lighter water pressure in their pipes said the design did not work well for their showers. There were complaints about plastic parts as well. You may not pay much attention to your showerhead, but if you experience low water pressure or notice that your skin is drier than usual, a new showerhead could be the solution. The House Method Reviews team reviewed the best of Moen showerhead products designed to remove impurities from your water and strengthen water pressure, so we could find the best showerheads for you and your home. We tapped into showerhead reviews from Moen customers to learn what consumers care about most when buying a showerhead. Providing a variety of spray and pressure settings, these allow you to tailor your shower experience. Some popular spray settings include massage, jet, and pause. The massage setting offers higher pressure, making you feel more relaxed, the jet setting also offers higher pressure with a concentrated stream option, and the pause setting delivers medium pressure with an on-and-off water pattern. We recommend these showerheads for households with multiple people that prefer different water pressure settings or for those who like to switch up their water pressure in the shower. Many of The Moen showerheads reviewed here offer different spray settings. The Magnetix models and the fixed 9 inch diameter rainshower models include a massage mode. These luxurious showerheads are large (typically eight to nine inches wide) and provide a spa-like experience. With their large head and wide spray pattern, they reduce water pressure and provide a soft, soothing flow (similar to raindrops falling on your head). However, they’re not as powerful as other types. 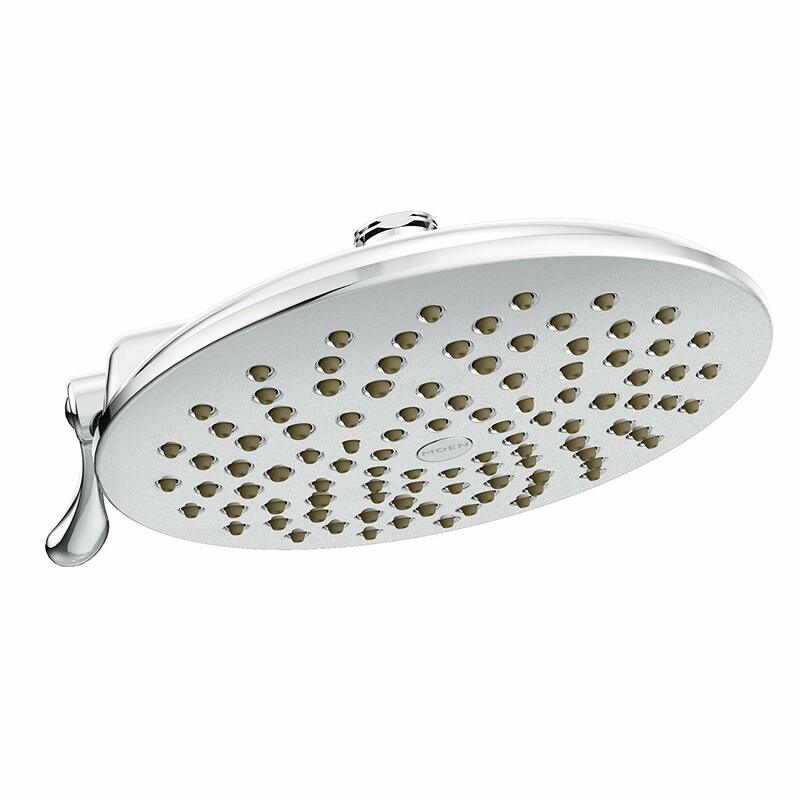 We love the Moen 26017 2.5 GPM Rain Shower Head from the Halo Collection—it has a sleek and modern design and provides decent water pressure. Low-flow showerheads are eco-friendly options that are specifically designed to use less water, saving you money on monthly water bills. Even though these use less water, they still offer a strong and powerful flow. The Moen Magnetix Six-Function Handheld Showerhead with Eco-Performance is a perfect choice for those looking for an eco-friendly showerhead from Moen. Most showerheads are easy to install and can be put together with little to no DIY experience. You’ll typically need to unscrew the old showerhead with an adjustable wrench and remove any plumber’s tape from the threaded part of the shower arm. Apply fresh plumber’s tape over the threads for a solid seal and screw your new showerhead into place. Your purchase should include assembly instructions, but you can always hire a professional plumber if you need assistance. Most of the Moen products reviewed here today do not require extra tools or parts and can be installed easily by the buyer. In fact, since they are designed that way, most installation guides on many of the products reviewed here recommend hand tightening over the use of tools as they can damage or scratch the plating or finish on the product during installation. If you think you have to buy the most expensive showerhead available to get the best flow, think again. 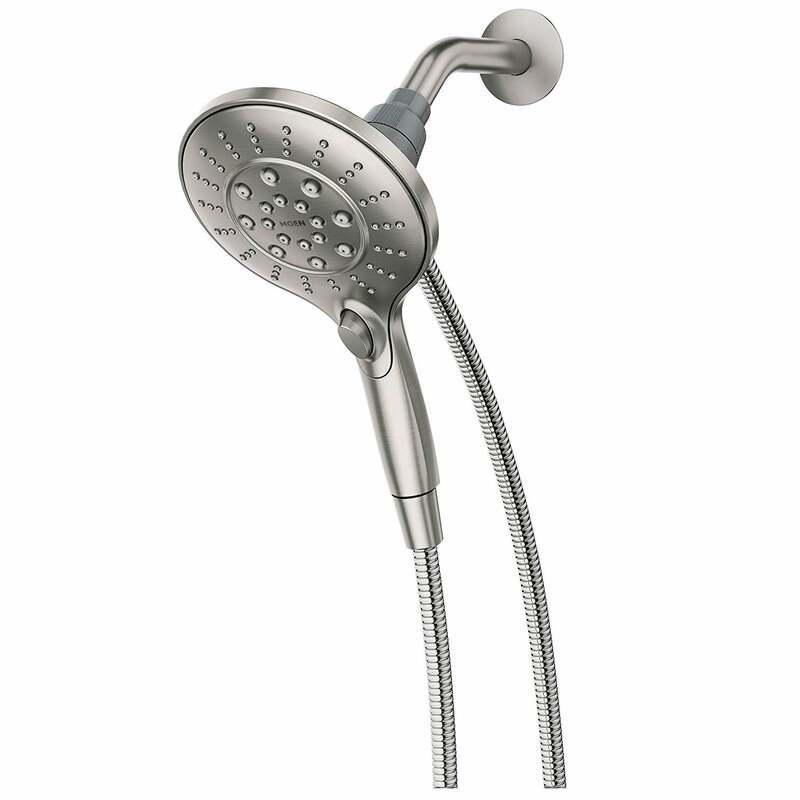 Moen Showerheads can range from as little as $23.35 MSRP to $762.00 MSRP. The Moen Magnetix Chrome Remote Dock is less than $25 and the Moen 26017 2.5 GPM Rain Shower Head from the Halo Collection in chrome currently costs $44.37 and is one of our top picks. What is the highest pressure Moen showerhead reviewed here? 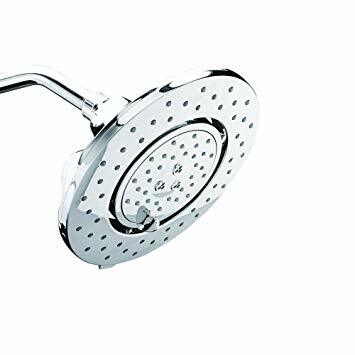 The Moen leader in high-pressure showerheads we reviewed is the Moen S6320 Velocity Two-Function Rainshower 8-Inch Showerhead with Immersion Technology. Their 8-inch diameter rainshower features Immersion technology that provides three times more spray power than most rain showerheads. A water restrictor, commonly known as a flow restrictor, is designed to reduce water flow in a showerhead to 2.5 gallons per minute. The National Energy Act requires flow restrictors in all showerheads. All of the Moen showerheads reviewed here have flow restrictors that can be removed by the buyer but you may want to carefully research how to do that. Removing water restrictors could also affect your warranty, particularly if you damage the showerhead in an attempt to remove the restrictor(s). 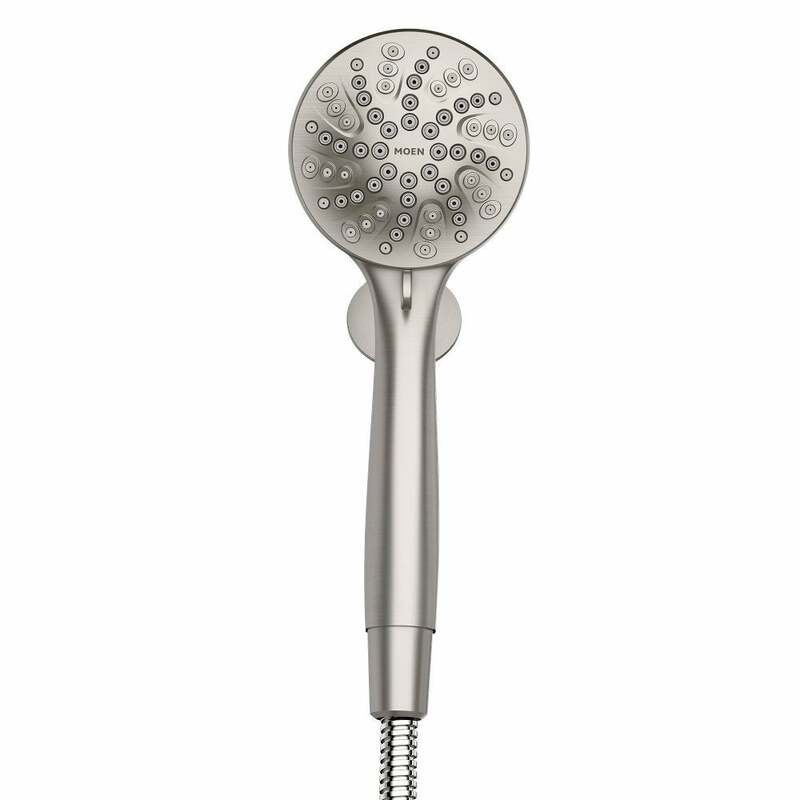 In our opinion, the best Moen rain showerhead is the Moen S6320 Velocity Two-Function Rainshower 8-Inch Showerhead with Immersion Technology at 2.5 GPM Flow Rate. It provides a spa-like experience while delivering adequate water pressure.